Boots No7 are continuing on the up and up with their seasonal limited edition collections – this is another one that I am sure will be on a load of bloggers must-have lists. It’s a fairly average looking product from the packaging, but in practice it’s very exciting. I was immediately keen to try it when I went along the press show a few weeks ago – and now I have had the chance so thought I would share my first thoughts. 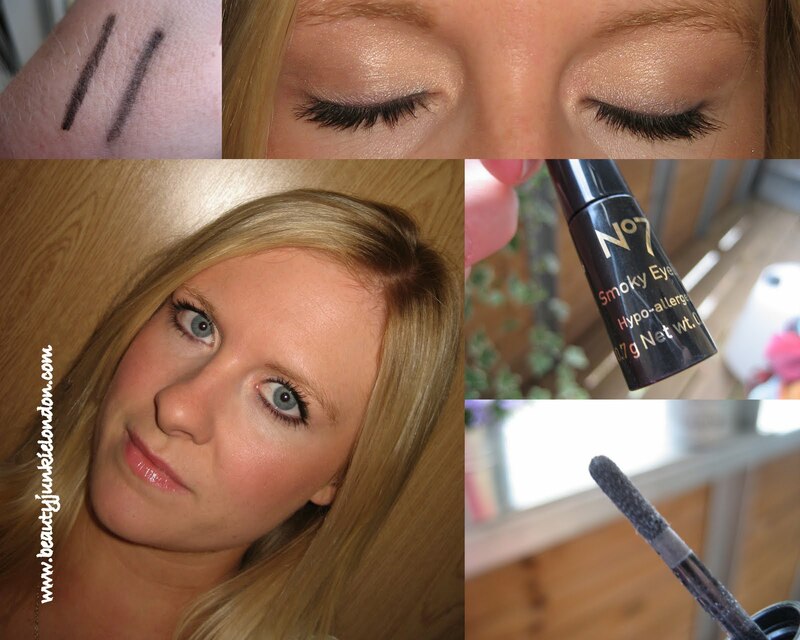 The smoky eye liner is an eyeliner, with a difference. The applicator is long, thin, and spongy – it bends when pressure is applied but is very hard to go wrong with. The liner is a dark powdery substance that is dark but looks magically blended/softened on application. The two lines on my hand in the picture above are of it swatched (the darker line) and then when I’ve rubbed my finger over it, so it’s slightly paler/greyer – so it can be blended further. Also, it could be layered to make it darker/thicker – if desired. The things that I love about this product are that it is so ridiculously easy to apply, no need for blending and it lasts well. Because it’s a soft, blended line it looks good for day time too. The picture above was just a casual blended look that I wore on Saturday. I love a bit of dark liner, but I wouldn’t normally wear it in the day time, but this one is easy to adapt for day or night. The only downside of this product is the fall out – when being applied it does tend to drop onto the cheeks. So I would suggest either a dusting of loose powder under the eyes, or don’t do the under eye make-up till after the eyes are done. This product is coming out in August as part of the v.impressive looking Autumn collection. This is limited edition, so I would suggest if you like the sound of it – snap it up quick. It is a fairly non-descript product by the packaging, but I predict quite a hype around this one. I’m going to grab a back up! This product was provided free of charge for review. All opinions honest and impartial. Ooh your eyes look very pretty in this photo!